Firstly nice job and congratulations on your sauna. Everyone should have one. I was wondering about the electrical piping, we don’t do that here, and then i found out it’s in the states, so not wondering anymore. I’d cover it up though, it’s not really nice looking. Just put some gouged log on it. Unfortunately i don’t have electrical sauna outside. Mine is inside, so for this to be useful for me, i would need a way to close the door between shower and sauna, when the stove is activated. But i’ll see if i could adapt it. One could add a humidity sensor, you know, for fun or fans. 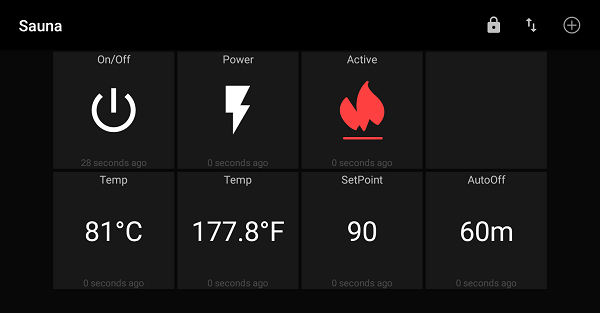 Breaking news: sauna-owner cooked alive by blackhat using hacked wifi. Some things are better left to robust control WITHOUT any cloud connection. The classic thermostat and timer for the sauna are a quite good solution. Of course a remote activation could be tempting, especially on a dark, cold winter evening it could be nice to switch it on before you arrive at home . But it’s not good if some random hacker is able to switch it on or change the temperature setting (electricity bill, fire hazard). I’d keep the original thermostat in series on high. That way if the esp8266 fails, it still won’t cause a disaster, just a high power bill. Sauna thermostats go up so high that you still have a risk of fire if you leave it on. The thermostat is at the seat level, and the temperatures at the ceiling can go up to smoke point if you leave it on. Rather, you need a re-settable timer that only lets the sauna run for something like 4 hours, and then requires a full power cycle. Is it possible that any comment critical to or things has to wait for moderation? Probably just the stupid ones. The nice thing with this sauna is that it sits outside, so if it were to catch on fire, it would not necessarily take your house with it. My sauna is in the house. I have not used it in a while. It takes quiet a while for it to really get up to full sauna mode. It is somewhat like one of my shops that I only heat when I am out there. I can get the air up to a nice toasty 72 degrees or more pretty quickly, but anything with any mass is still ice cold and stays that way for a long time. While the air is warm, you can literally feel the cold from the walls. The sauna, while not in an unheated space is similar. It takes a long time for it to totally warm up. Until than it is kind of a hollow warmth. Hard to describe. A remote turn on would be nice as would a timer to remind you in a few hours that it is good to go, and also having some semblance of a “standby” mode that is not quite sauna hot but is also not room temperature cool. I would always have some kind of simple mechanical thermal cut on in series with the heater though. I like electronics as much as the next guy, but they can fail. Even a simple klixon switch with a beefy relay would offer you protection if something went wrong. I want to make a similar gizmo for keeping my plumbing from freezing and we are not a good candidate for heat tape, and one of the thing I will have in the system is a simple mechanical safety in series with the heater. I think having the wifi remote is cool. It just needs to have some safety features included.